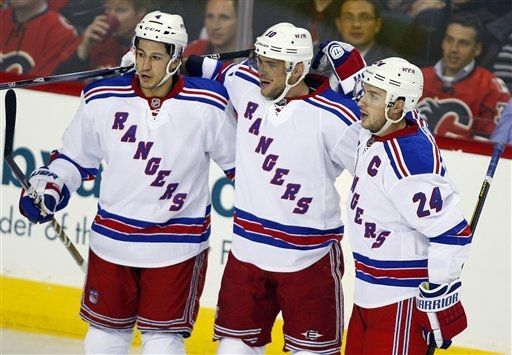 After going winless in Sweden and the U.S., so far, the Rangers have had some great games in Canada. Their game against Vancouver on Tuesday earned them their first win of the season, and last night’s game against the Flames saw them skate away with a fantastic 3-2 overtime win thanks to Sean McDonough’s goal that came with 1.5 seconds left before the buzzer. 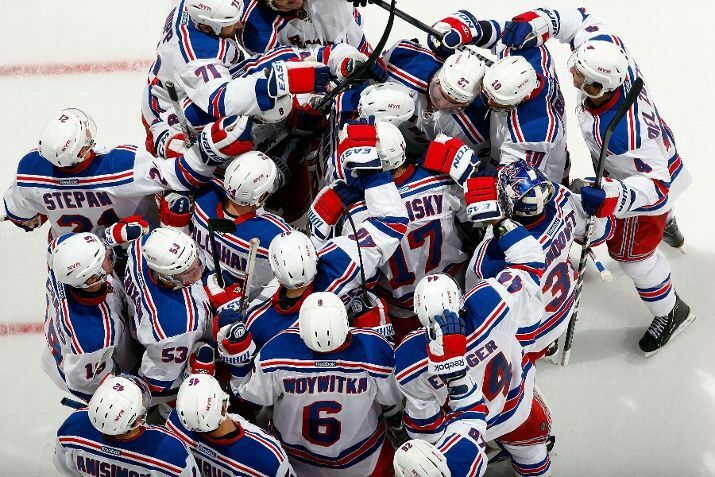 The Rangers are now 2-1-2. Despite having earlier screened Henrik Lundqvist to enable the Flames to tie the score at 2-2, he more than made up for it with that in this game. So far, McDonagh has scored 2 goals and an assist in these 2 games in Canada and has provided a key backline lift to the Rangers offense. 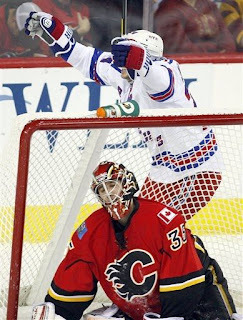 The game featured a battle of the Henriks in goal – Lundqvist for the Rangers and Karlsson for the Flames as Mikka Kiprusoff was given the night off. The official Recap can be found here. the upcoming renovations. Just thought we would mention that. The 4 regulation goals were all scored in the first period. Marian Gaborik was able to get the scoring started in the first period with a power play goal at the 4:53 mark that came only a minute after Sam Rosen mentioned that we were the last team to not have one. The goal broke a season long powerplay schneid of a pitiful 0-for-16. broke the Rangers' season long power play futility . What was noteworthy about the goal was Gaborik’s hard work on the ice. He covered for Michael Del Zotto as he pinched in and was engaged around the boards. Gaborik’s presence there prevented the puck from leaving the offensive zone and enabled the Rangers to continue to exert pressure. Gaborik’s work paid off when he worked himself toward the top of the circle where he received a pass from Derek Stepan that he immediately shot past Karlsson on his glove side. The first line’s chemistry (especially between Brad Richards and Gaborik) seems to be showing some promise. Jarome Iginla managed to get one by Henke about 2 minutes later to even it up. Then, Brian Boyle and Brandon Prust, demonstrating their long-standing chemistry teamed up to score a shorthanded goal while Gaborik was off the ice for a hooking penalty. Boyle rushed into the Flames corner to steal the puck from a Flame and snapped a pass to Prust who bulleted it past Karlsson. Within 2 minutes, during yet another power play, the Flames tied it thanks to a goal by Mark Giordano. Unfortunately, McDonagh was slow in getting out of Lundqvist’s line of vision and the puck whistled past him, leading to the goalie getting visibly angry. It was one of only 2 goals allowed by Lundqvist. The rest of the game, Henrik was again unbeatable as the Flames had a 20-13 edge in shots during the final 2 periods. it a habit since last year's finale against New Jersey. One of the best highlights of the game was the second period PK, which had to be one of most focused sessions I’ve seen from the Rangers so far this season. Calgary had very little time to set anything up before the play was picked up and the puck was dumped down the ice. If they can make that part of the regular routine (and avoid screening Lundqvist or Biron), they should do well down the road, defensively. The team overall seemed to have an easier time of keeping up with this team - it wasn’t so much of a chase this time around as with the other foes. Whether this is a sign of the Rangers getting into a game routine will remain to be seen. Flames fans know the game is over. That is, if the Blueshirts can avoid the penalties, at least. This remains a really big problem for the team, and we took a number of them that didn’t need to happen. Not counting the fights Rupp and Newbury had, Gaborik’s mini stick lift after skating behind the net got him in trouble in the first period. This changed slightly in the 2nd and 3rd periods, but we had two instances where the puck was dumped over the glass for delay of game calls rather than down the ice. The look on Tortorella’s face was priceless and I’m sure that both Woywitka and McDonagh are going to get pulled aside for a discussion. Well, Woywitka will, at least. He is definitely a work in progress. 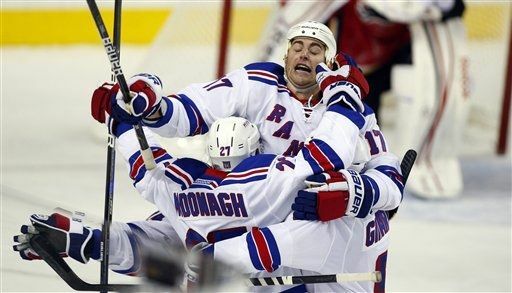 McDonagh’s game winning goal may get him out of trouble. I’m not sure how the officials didn’t catch that hooking call on Gaborik in the second period after his breakaway. Everyone seemed to have noticed that, but the officials let that one go. Same goes for a stick to the face that Dubinsky caught behind the net. You’d think with all of those cameras, they’d possibly take notice. Still, the missed calls luckily weren’t part of game changer moments and didn’t cost us anything. This seems to be a continuation of the patter from last year but the Rangers do not have Avery on the ice who seemed to be the referees’ whipping boy. The next game will be against former Ranger Coach Tom Renney and the Oilers on Saturday night. And then a trip to Winnipeg before the Rangers finally arrive at the new MSG for their first home game. Cubicle Crew, if not now, when?